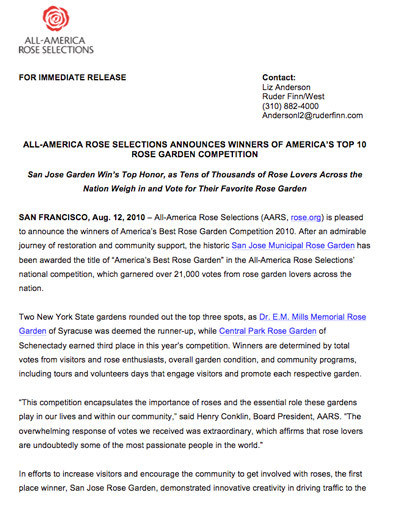 The San Jose Municipal Rose Garden beat out over 100 accredited rose gardens throughout the United States to win the prestigious “America’s Best Rose Garden”. In just a few years’ time, the garden went from probation to America’s Best. This was possible through an innovative public/private partnership between the City of San Jose and the Friends of the San Jose Rose Garden. 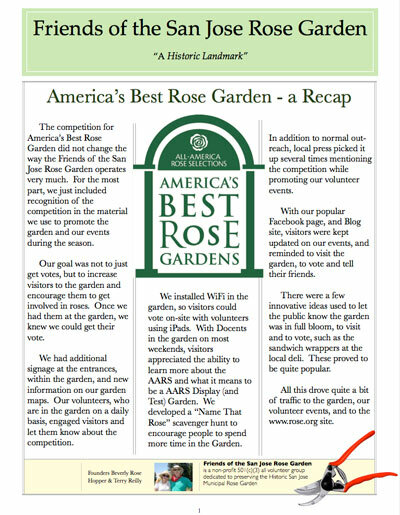 The All-America Rose Selections, the 70 year old nonprofit association dedicated to the introduction and promotion of exceptional roses, organized a nationwide competition to find the best public rose gardens and select a winner to become “America’s Best Rose Garden”. The voting officially started on April 1st, 2010 and closed July 1st, 2010. The top ten gardens with the most individual votes will become finalists. Then, a panel of experts from AARS will travel to the five finalist cities, evaluate the gardens, and select one winner based on beauty, creativity and the garden’s overall contribution to its community.